Waking at 6am I was reluctant to go outside due to the noises of last night. Me being pathetic, also it was one of the coldest nights so far. I set off at 6.30am knowing Kalkfeld was going to be another town to stock up on bits and another landmark, which mentally was a stepping stone to start heading North East. My legs for the first few miles feel slightly heavy but soon wake up. Being surrounded by such beautiful landscape, antelope running across the road and warthogs trotting into the shrubs help the miles go by. It’s usually around the 6 mile mark that my legs and body kick into action and I feel like I can run for long periods. We reach Kalkfeld where we all scoff chips which seemed to taste rather nice even though they were more like French fries. We managed to find accommodation at a convent, a bed and a shower is much appreciated. In the evening Libby, Peter and myself covered another 6 miles taking today’s total to 23 and passing the 200 mile mark. A warm shower and early night. I woke shortly after 11pm with stomach ache and a lot of wind and struggled to relax and sleep. By 2am I had diarrhoea followed by being sick. I was grateful that I had a bed and a toilet to be sick into in the middle of nowhere this would have been more difficult. Laying on the floor sweating I counted to 10 before returning to my bedroom. It’s frustrating that in the space of a few hours I can go from a high to a low. I had two days off, instead of being filled with negative thoughts and frustration it’s all part of the journey. A message from my mum telling me the news that our friend lost her battle with cancer puts these things into perspective and I really don’t have anything to moan about. Instead turn the two days off due to illness into thinking it’s just two days rest. I’m sure the rest will help me in the long run. So I’m back after illness, it’s certainly tougher to get up due to breaking the routine. Libby, Steve and myself set off to the start point and within 1 mile my legs feel like brand new. Not to get too carried away I needed to rein my pace in a bit and confidently finished the day with 13 miles. I want to ease back in as it’s still a long way until we reach Mozambique. I can catch up lost miles in the latter part of the run. The main thing is I feel strong and the confidence and smiles are back! An incredible moment happened early on too, stood in the darkness amongst the trees was a Giraffe – a beautiful moment. In the afternoon we move from the convent to a camping site called the Crocodile Ranch. We spent the afternoon relaxing in the shade and I was fortunate to meet the owner Anné Noelle who kindly let us look around the crocodiles and surprised us with 5 pizzas. For once I’m listening to advice and being sensible so decide to miss the evening session confident I will return tomorrow full of pizza ready for the marathon distance. Quite a restless night due to the sound of dogs howling and barking. I think this must be the first time in my life I actually hated dogs. We set off at 6am to re-join the route, it’s been quite a mentally frustrating week because it feels like I’ve been playing catch up. The first 6 miles went smoothly then I lost concentration and the long road ahead seemed forever. Instead of concentrating on one foot in front of the other and reducing the miles one by one I seemed to concentrate and how far the road looked. I also felt I was running on empty so called it a day at 16 miles. Disappointed but realised I needed to spend the afternoon loading up with food and a sleep. 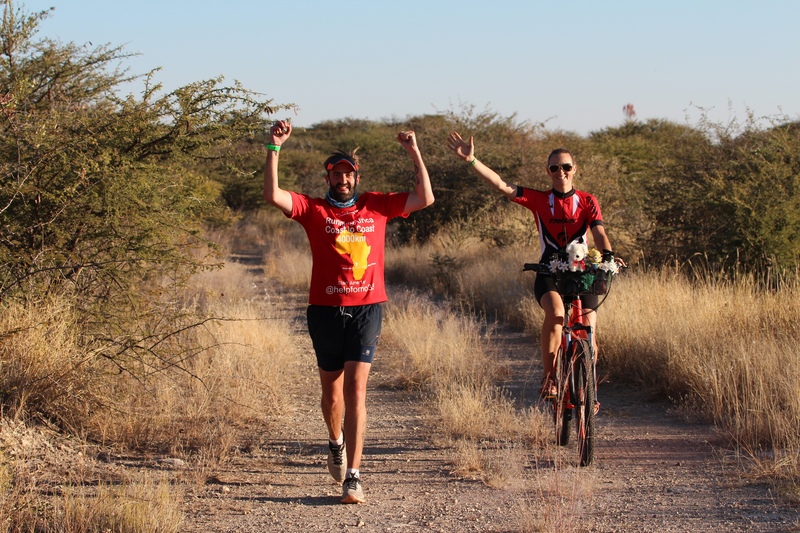 Setting off at 6.30am we finally reached Otjiwarongo and as soon as I ran through it gave me a huge mental boost as at last I felt we were pushing forward. I was joined by a local man who was running, he seemed extremely fit, his English was very limited but he seemed to enjoy running with me for a few miles. We reached the 20 mile mark, a quick donut and some juice and I ran on finding a nice dirt track alongside a railway line. I completed the day with a big smile, 26 miles under the belt. We camped at the side of the road and everyone went to bed early. My team did the usual clear up, each playing an important role of making this run easier for me. I’m extremely grateful for them giving up their time to help. I will be introducing them one by one over the coming week. A really good nights’ sleep, same little routine – running kit on, Polar M430 running watch on, head torch, bottle of water and a coffee and off we set. The route today we joined the tarmac road again, it’s a little less eerie on the main road as there were many large trucks zooming past. Their headlights lighting up the road as I jump off to the side. The first 6 miles I felt quite strong and then we stopped to see our first zebra, a beautiful scene across the African plain. I stopped for some pretzels and some water and then set off again determined to put my head down and stride on. I covered 21 miles before heading to Khoi Khoi guest house where they kindly gave us a free camping site. Beautiful gardens, certainly a nice place for everyone to relax. We even got a tour round the owner’s land which seemed to go on for miles. I set off for an evening run running a further 7 miles finding a small track along the railway line was certainly a welcome break from the busy main road. Another big day under my belt, lasagne and salad for dinner and an evening on sofas relaxing with the team. A great way to end the week. I look forward to having a sleep in a bed tonight. ← Day 1 – Day 8 The Run has Started.